Another room we have in our offices is our testing room. When you see this room on a tour it will probably seem pretty boring. But there’s a good reason it’s boring! We want to get optimal performance out of the person we’re testing, so we want the testing environment to be quiet and distraction-free. The walls in this room are completely bare—we don’t even have a window, because windows can be very distracting. We even have an indicator on the door so we can mark the room as “occupied” to keep out interruptions by people walking into the room. This room is also set up to be flexible and accommodating. We have larger chairs for young adults and small chairs for little guys. We have timers and stopwatches out and ready because many of the things we do in therapy are timed. We store all of our testing protocols in this room. You probably have no idea just how many tests we have! We have about a dozen for occupational therapy alone. Physical therapy and occupational therapy use some of the same assessments, but each also has probably another half a dozen of their own tests. And speech therapy has about 15 assessments. But we keep all the testing kits in here so that our therapists can have them ready to just pull out and use. This way we’re not trying to organize a test while your kiddo is here and waiting. We also have some file cabinets in here with all the testing files on each child. When it’s time for your child to have a reassessment, we have their file right here and ready with their testing protocol from the last time they were tested. We do this because of our flexibility model which means that if your child’s schedule changes and they start seeing a different therapist, the new therapist has access to your child’s full protocol. 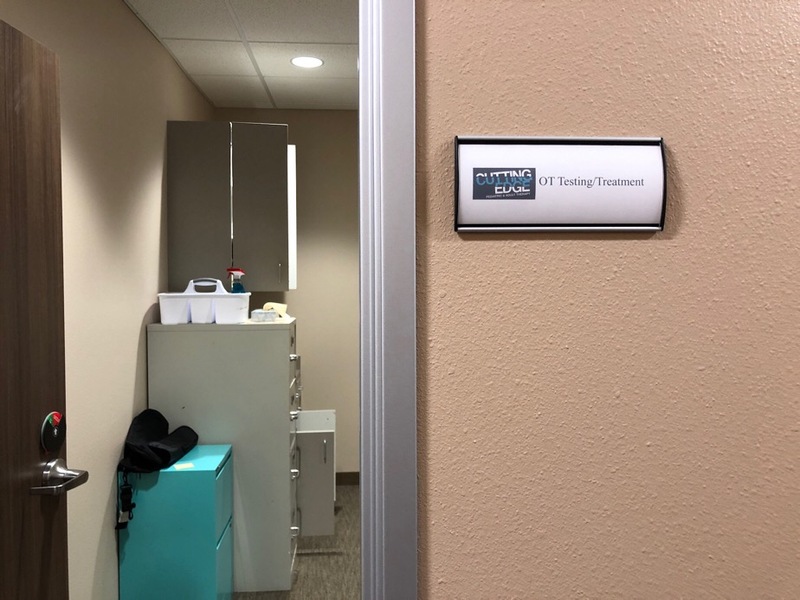 So when you visit this room and think that it looks boring, just remember that it’s purpose is to hold all the testing equipment and information, and also to be a calm, distraction-free testing environment for your child. Please let us know if you have any questions about testing, or would like more information.